People are stressed. They are stressed for time because they have a lot of things they want to do. They have a lot of commitments they have made, little time to accomplish it all, and it brings on stress. There are more good things a person could do each day than could possibly be done, and that can really bring on the stress. 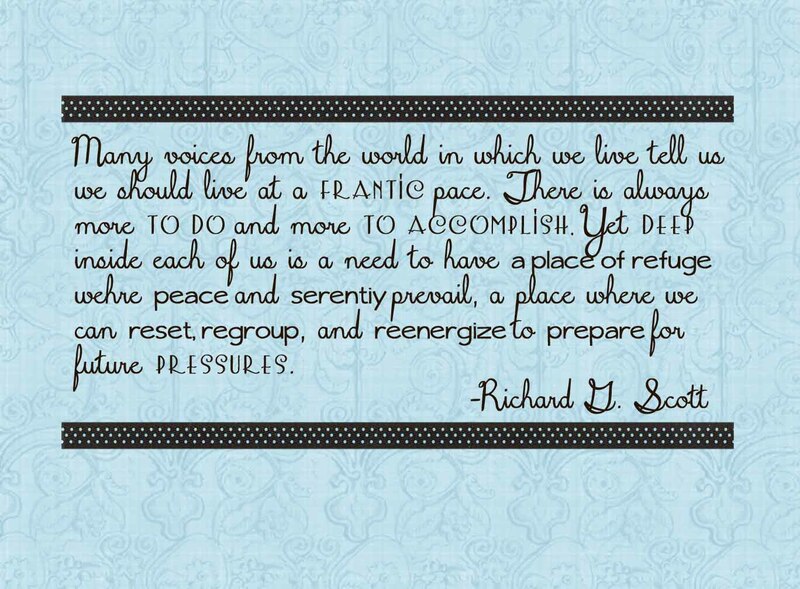 Many voices from the world in which we live tell us we should live at a frantic pace. There is always more to do and more to accomplish. Yet deep inside each of us is a need to have a place of refuge where peace and serenity prevail, a place we we can reset, regroup, and reenergize to prepare for future pressures. This leads my thinking in two directions. The first is our home. What is our home like for our family? Is it a place of refuge? Is it a place our family members can go to where they can feel peace and serenity? Can they regroup in our home? And if not, how can we create that environment for them? We can accomplish this by leading our families in love and peace. We can focus on the Lord and make Him the center of our home. We can be prayerful and thoughtful in our decision making. We can teach our children to think of others and contribute to peace in the home. We can pray as a family and learn together as a family. We can use our time wisely and not waste it. We can turn to scripture first instead of the Internet. We can serve our family and others. We can recognize the good in others and not focus on their imperfections. We can focus on virtues. We can make our home a place people are drawn to because of the good feeling they get there. And that all sounds nice, but also overwhelming right! We aren’t expected to be perfect. We are only expected to do what we can and do the best we can. We CAN”T do it all. We just can’t. There are many good things we just won’t have time for, and that is okay. We can focus on what is of greatest worth and put our efforts there, and change those efforts as it seems appropriate. The second train of thought I take is where can I go for peace for a place to regroup? Hopefully my home can be a place where I can feel peace and serenity, but for me, my home is also my workplace. It is the source of stress for me. It is the place I look around and see the “more to do and more to accomplish.” So the house as a whole is in all honesty probably not going to be a place I walk into and leave my cares behind me–it is more like I walk out of it and leave my cares behind me :). But I want to be able to find a place of refuge in my home. In the How I Do It series, I did a post on How I Do It: Relax. It was not my forte. Okay, okay, it still isn’t my forte. But I think I have improved some. First and foremost, the place to turn for peace is to the Lord, but even that is easier said than done in your home with several children needing you. So I always stick to my “read scriptures in the morning” policy to help me there. I have really found two things I can do to be my place of refuge. One is singing. I can turn on music while I am making dinner or sewing or driving and just sing along and let the “to-dos” leave my mind. Second, I have found reading really is a great way for me to regroup and take a break from the “to-dos” of life. Not reading a non-fiction, informational book. I need to read a book that is just for fun. I find a place to get comfortable and read. When I do this, I can get lost in my book and come out of it realizing all of those things I thought I needed to do weren’t so frantic after all. So reading for me is a great place of refuge. You can find your source of refuge in your home–your thing that lowers your stress level and helps you face another day. 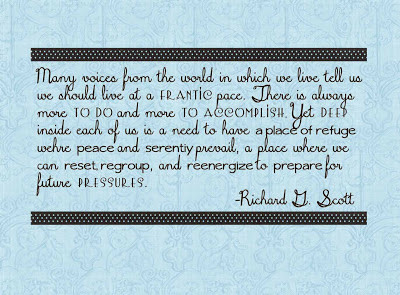 What are your places of refuge? Thank you for this reminder! I agree with everything you just said! Love reading your blog by the way! Have used it for a reference with both my boys! Thanks for this post Val. I feel reinspired about making our home a place of refuge for others. That doesn't mean that it has to be spotless and perfect, it means that we are those things you mentionned – full of joy with God at the centre of everything. Confident in him rather than putting on a confident exterior. You are all welcome!Juggler I am glad you mentioned making it a place of refuge for others. Did I talk about that? I can't remember. I have been thinking about that a lot lately–making our home a place where people can come to feel that peace who don't necessarily have other places to go for it.